mine was filled with family, friends, food, and a healthy dash of silliness. This entry was posted on May 29, 2012 at 8:00 am and is filed under general. You can follow any responses to this entry through the RSS 2.0 feed. You can leave a response, or trackback from your own site. we definitely did, even though there were three of us and only two squirt bottles! 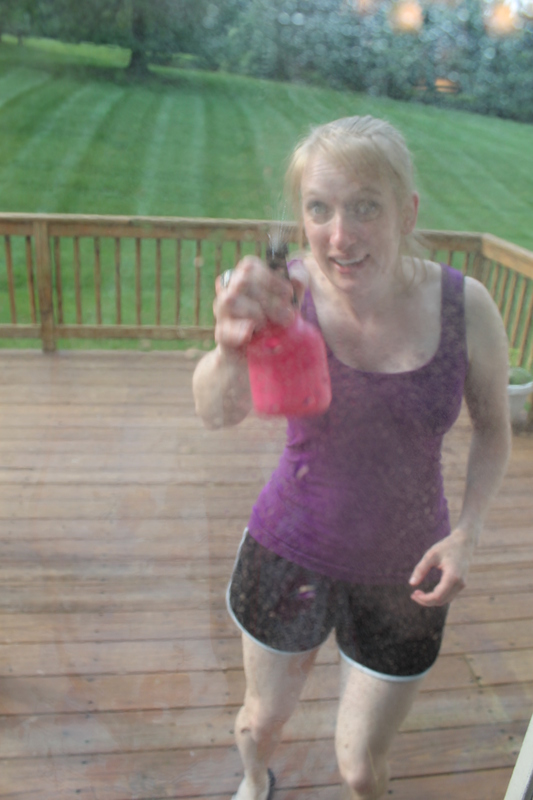 baby mac hijacked one of them and was “watering” the porch and the flowers and the grill and our feet… ha. Baby Mac had so much fun with her aunt abby!! She misses you tons and so do I!!! i believe sister E has usurped my position as favorite aunt, so i’d say baby mac had more fun with her, but i’ll take the fleeting moments i can get out of her! :) especially when the AC isn’t working and squirt bottles are the only form of cooling down! Love that pic! Looks like you had a fantastic weekend. Those little squirt bottles are perfect when the temp rises. it was the coolest (chilliest and awesomest) part of the day!